Let me preface by telling everyone what a game changer Express Pass at all the HP attractions is. No more getting up at the crack of dawn just to ride Gringotts or FJ once a day before the waits balloon to 1.5 hours or more. We literally walked on all three of the major HP attractions regardless of the time of day. That addition is huge because you can arrive a half hour after park opening and ride pretty much as often as you like, provided you are at one of the three premier hotels that provide complimentary Unlimited Express. Our Club Level experience at Hard Rock was actually really nice. A light continental breakfast before heading out is enough to hold you over until the afternoon. Eating at the buffets for $20 a pop makes you stuff yourself to think you are getting your money's worth, and you are sort of useless for the first few hours, in my opinion. All of the Express lines were under 5 minutes, except Ripsaw Falls. That was over 20 minutes, but we did go at the hottest time of year. JP River Adventure and Bilge Rat Barges were always walk ons. Reign of Kong - I think I have a new top 5 ride... I can't understand why so many people ripped on that attraction. I would expect it was because of long waits whereas we never waited more than 5 minutes. We rode it 8 times during our stay and got to experience all of the "tour guides". I think if we waited for 2 hours, it may have been a different story. Butterbeer and parking prices have gone up since our last visit, and I personally think the prices are now borderline ridiculous. This being said, I found out the parking is not part of the Lowes hotels, but it is contracted by a separate company, and they set the prices, then bill the hotel. We did more riding on this trip than ever before. It was the hottest time of year and the parks were as busy as I have ever seen them. I finally get the Jimmy Fallon ride as I didn't know the barbershop quartet (they are great, by the way) was simply to keep you entertained while waiting for you ticket color to be displayed in the lobbies. The ride was actually just a Jimmy Neutron clone for the most part, but the theming in that building is amazing. You normally have to reserve a return time, but Express holders are let in immediately. I noticed all of the good candy in Honeydukes and the store in Diagon Alley has been replaced with common garbage you can buy in any grocery store with inflated prices (like M&Ms). We tried to get into Toothsome for some late night milkshakes, but that place was insane any time we tried to walk in, so we ended up leaving without buying anything but some Macaroons, which were insanely expensive, but the best I have ever had. Mythos didn't fail to impress as they change their menu constantly, so there is always something new. I got the Pad Thai and cleaned the plate. It was amazing. The EP queue for HP takes you up a side stairwell and puts you right in front of Dumbledore's office, so you can stop and take all the pics you want while people pass you. Gringotts EP line takes you through the bank "lobby", so you can stop and take pics as well, but people will blow right past you if you are taking your time. The EP line for Gringotts was always a quick stop at the photo booth, which we blew right past, and it was straight to the elevator. The Hogwarts Express EP line basically gets you right to the platform right before the part that winds 2-3 times before you are assigned a row. It was literally a walk on at both end no matter what time of day. The Hulk is a bit different and the new launch tunnel is way better. You can hear the audio from from Spiderman and the track still "roars". The queue is all new as well. The reactor effects are much better and the ride itself is way smoother than before. All in all it was a great trip and I had never seen the parks busier. If you are staying at Hard Rock, Royal Pacific, or Portofino Bay, do yourself a favor and sleep in. There is no need for early entry at all anymore. We managed to hit every ride in both parks (including all HP rides) on our second day before 3PM and we arrived after 10AM. Then we hit all of our favorites again (some multiple times) in the evening. Good to hear. We're staying at Royal Pacific Club Level in October, and were extremely excited to hear the WWoHP attractions added to Universal Express. If you're able to walk-on in the summer, I can only imagine how easy it will be in October (still crowded, but nothing like the summer crowds). Just to confirm that on Gringott's, UE guests still get to experience the elevator, is that right?? The single rider line completely avoids the elevator, so is a critical element to the attraction if you've never done it before (like our 7-year old son, who was just slightly too short to ride the last time we were there). I don't suppose you cycled through MIB through the "Baby Swap"? That used to be our M/O on that ride to avoid having to walk all the way around through the gift shop and back through the single rider/UE line. I had heard that some ride crews were discouraging marathoning through the Baby Swap area, and were no longer scanning UE outside the entry door at the queue merge point. Not a huge deal for most, but if you're riding 10-15 times in a row like we usually do, saving the extra walk around the outside can save 10 minutes or more. Great report! Universal is always a pleasant and enjoyable experience for us. I agree about Kong -- it is a great ride, far better than the Hollywood version. The animatronic impresses me each time, and I enjoy the various drivers. Jimmy Fallon is really cool considering the small landlocked space they had to deal with. We'll be visiting again soon. Fantastic. Thanks for a great trip report. I've got very fond memories of all the three original UO resort hotels, but Hard Rock is by far my favorite. Glad to see someone else appreciate Kong. When I experienced Kong with a group of 4 it was among each of our favorites, yet online there is such hate for it. Definitely a top 5 non-coaster ride for me. Great write up .. thanks for sharing. 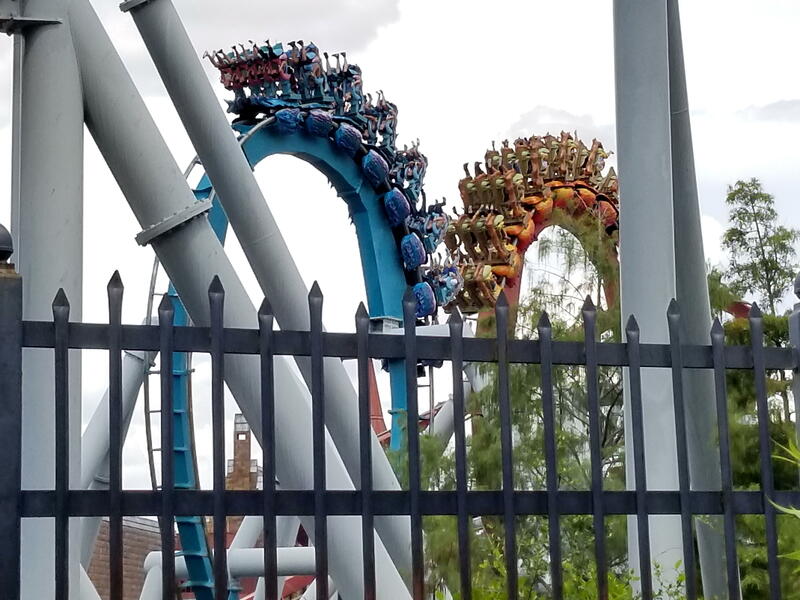 I haven't been to Universal for years and the loss of dueling dragons won't have me rushing back anytime soon. For those of us who live in Orlando (I'm 2 miles from Universal) the opportunity to use the hotel passes is a non starter so for anyone wanting to go and enjoy some peace and quiet go mid-week, a week or 2 before HHN or better still the first couple of weeks in November. Other than that the last couple of weeks in January. Everywhere is still very busy right now. Even at Seaworld tonight there was a 15 minute line for the Mako at park close, which was 7pm. The only park that doesn't follow the mid week off season "rules" us locals follow is the MK. No surprise there !! Cool! I haven't been to Universal Orlando in 4-5 years, so it'll be quite a new experience for me. And I'm definitely staying at TPI's favorite hotel - Portofino Bay. Report was fantastic - make me want to get on a plane and head there right now..
Reign of Kong is really good... We rode this in May but it was a 75 minute wait.... Only got to go on it once..
Hey Russell - I was just there last week and, yes, the Gringott's Express queue DOES include the elevator. Honestly, at the time we hit it, I wasn't impressed with it as an Express option (I've done regular line, Express AND single rider at Grigott's and they're all very much dependent on the crowds....), but it was certainly shorter than the main wait. P.S. Have ridden Kong multiple times since it opened (both with Express and without ) and have only experienced 2 tour guides. Eagerly awaiting experiencing more. Kong is definitely underrated .... Expectation may have been a bit too high, but the ride really is awesome! TH, no Volcano Bay this time. We talked about it, but then decided to skip it in lieu of going to Busch Gardens instead. I was going to do a part 2, but got very caught up with work. Never heard of the MiB Immigration tour before - will definitely look into that! N B -- it's not too late for a part 2!